Let’s talk for a second about hangovers. I had a really nasty one this past weekend, and as many of you may know, your appetite can either be non-existent or rampant. I tend to get much pickier and want something that will fuel me more than plain toast. Enter french toast, a great eggy bread kind of breakfast. 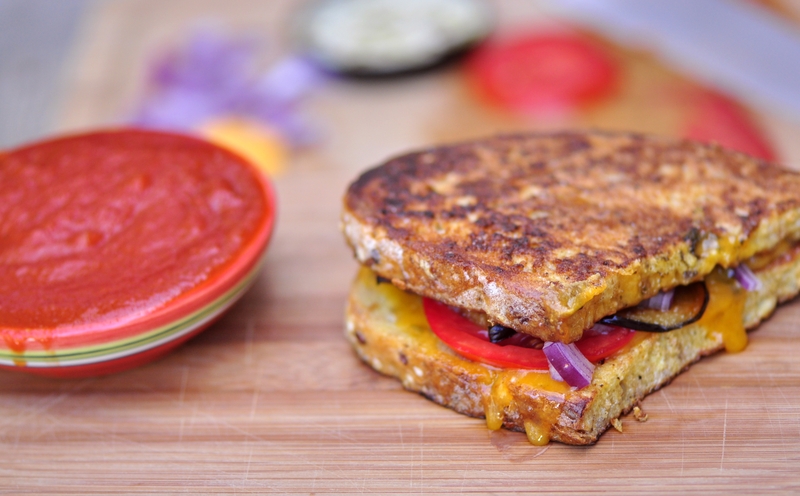 This was my first time trying savoury french toast and it worked perfectly as a sandwich bread; the eggplant, tomato, pesto and cheese don’t sog up the bread because of the coating. I made two sandwiches that morning, and I found that if I cooked the bread on a slightly lower heat for more time, the sandwich turned out better. I like my bread with a bit of a crunch—if you prefer softer, I’d go for a slightly higher heat with less time so the outsides still cook and become lightly golden but the insides are just cooked. Heat oil in a frying pan on medium-high heat and add eggplant slices. Fry on each side for 3-4 minutes until lightly golden; once done, place cooked eggplant slices on a paper towel to drain excess oil. Reduce heat to lowest setting or remove from heat completely—you will need it again in a few minutes so keep it on-hand. In a medium-sized bowl, whisk eggs, water, pepper, salt and chipotle hot sauce until light and bubbly. Heat same frying pan on medium heat. Dip each slice of bread in the egg wash so that both sides are fully coated and some has absorbed into the bread’s middle, then place each slice on the pan. Cook for 5-6 minutes on each side so that the egg in the middle is cooked through and the outsides are golden. Quickly remove bread from pan without turning off the heat and spread pesto on one of the slices. Layer the cheese evenly on the surface where the pesto is, then lay the other slice of bread on top. Return sandwich to pan and cook until cheese has melted. 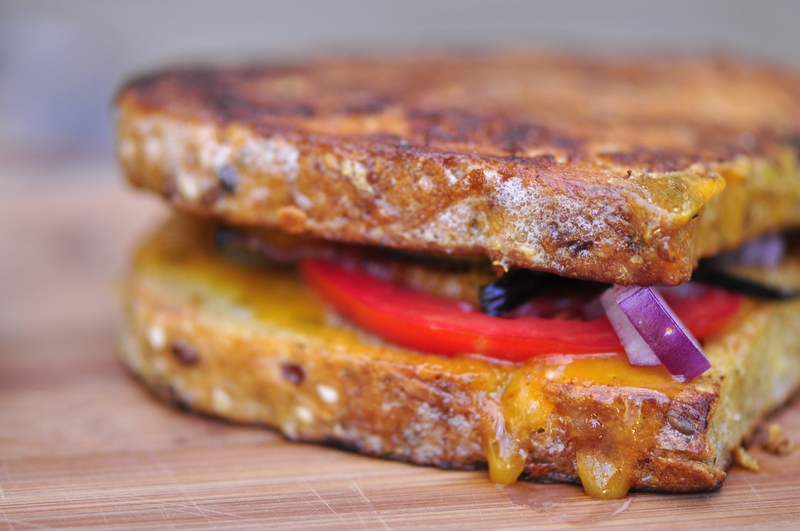 Remove from heat and carefully add cooked eggplant, red onion and tomato slices (cheese will be gooey and hot!). Serve immediately with a tomato sauce for dipping and enjoy! This literally looks like the best sandwich on the planet! I’m going to attempt to make this but I need dairy and gluten free so I don’t know if it will looks as deliciously glossy! I’ve never made gluten free French toast but I think it would be really nice because it would prevent it from becoming dried out! As for the dairy free I haven’t ever used egg supplement but I think it should work fine–if you attempt it let me know how it goes! 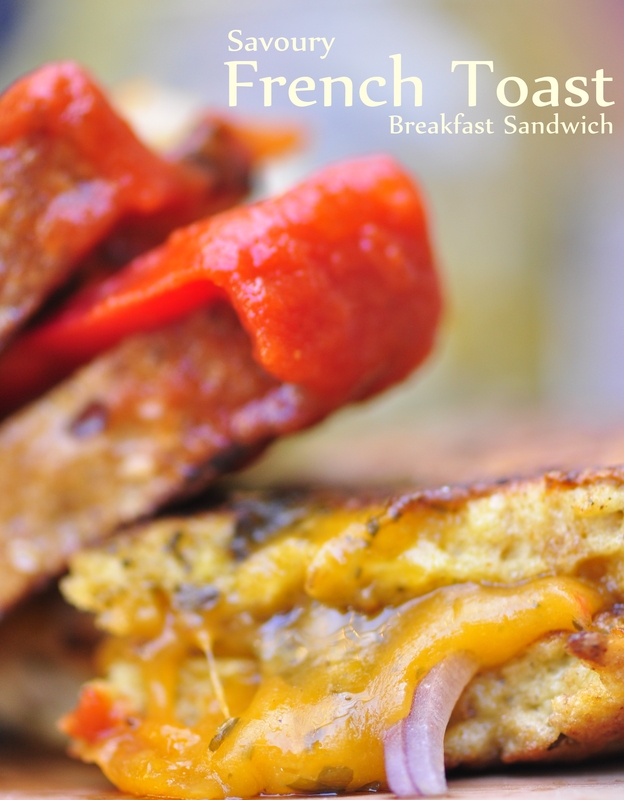 This savory french toast sandwich looks awesome! 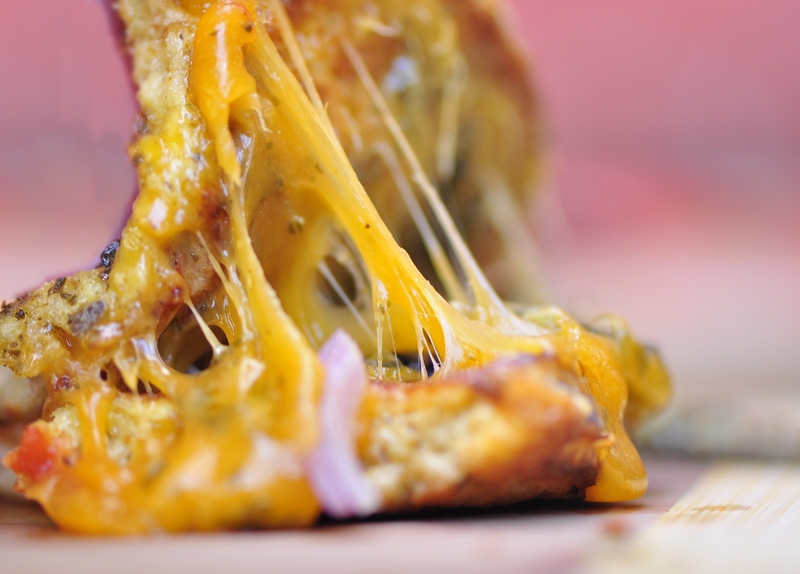 Love that gooey cheesy goodness. Delicious! I couldn’t believe I’d never tried it until now either, so so good. Thanks!